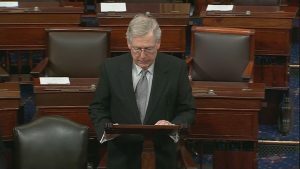 WASHINGTON, D.C. (NBC News) – The Senate is set to vote Thursday on two competing plans to end the ongoing government shutdown. Republicans will pitch the president’s plan: Temporary protection for a million immigrants if he gets money to build a border wall. The plan supported by Democrats will reopen the government for two weeks, and allow negotiations on border wall funding once that happens. Neither plan is expected to pass. Meanwhile, the FBI says the shutdown is making America less safe. “The failure to fund the FBI is making it more difficult for us to do our jobs, to protect the people of our country from criminals and terrorists,” FBI Agents Association president Thomas O’Connor said Tuesday.